Oops… even celebrities get it wrong sometimes! We’re telling you why Will Ferrell and Anna Wintour’s fashions fell short in our weekly feature. Learn from the stars’ sartorial slip ups! What the fug, Will Ferrell? 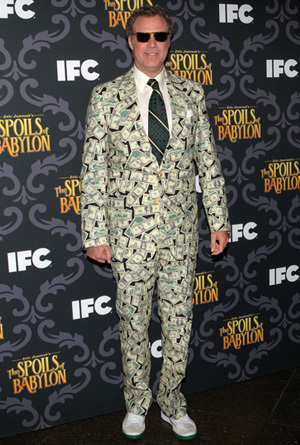 The Anchorman actor clearly wants us to know he’s raking in big bucks these days since he attended the premiere of his IFC miniseries The Spoils of Babylon in Los Angeles sporting a suit printed with dozens of dollar bills. If you’re making so much moola, can’t you afford a nice suit to wear to a red carpet event, Will? Yes, we get that this is supposed to be funny and irreverent but the cash-patterned number just looks cheap. Head-to-toe patterns are tough for anyone to pull off, much less a middle-aged man in a suit! Will accessorized his over-the-top look with a black and white striped and polka dotted tie just to further add to the clashing chaos and topped it all off with sunglasses at night. The final verdict? Not only is this suit tacky, it’s also recycled. Will already wore this attention grabbing getup to the MTV Movie Awards last year. Listen, third time is not a charm for this number… please put it away and never repeat this again! Just because Anna Wintour is the editor-in-chief of Vogue and had an entire movie made about how fearsomely fashionable she is (The Devil Wears Prada) doesn’t mean she gets a pass when she shows up looking like this. Anna hit the Girls Season 3 premiere in NYC looking like her inspiration was Cruella de Vil, the fur-loving villain in 101 Dalmatians. Yes, it’s freezing in New York right now thanks to that polar vortex, but there are plenty of beautiful fur coats out there and a portrait printed Prada number isn’t one of them. A huge fur coat is a statement piece on its own without having someone’s face on it! The hem of Anna’s black dress is also hanging out, giving her a witchy look. The final verdict? The British editor is also carrying her premiere ticket and iPhone on the red carpet. Seriously? We know you’re an uber busy important woman, but can you please put your phone in your pocket while posing for photos? Your assistant can wait a few moments to be yelled at via text message, we’re sure.